As the month of June slips by, our challenge for the second quarter draws to an end. I’m happy to say that several quilting friends accepted the challenge to make quilts with jelly rolls. I know you will be inspired by their projects! Stephanie sent a picture of “Plum Pie.” This layout is a variation of Spiral Strips (found in the book Jelly Roll Quilts by Pam & Nicky Lintott.) Click here to travel to Stephanie’s blog and read all about it! Sally shared her “Mexican Stars” quilt. The design is also known as “Stars and Crosses” and was a June Block Party quilt by Eleanor Burns. The tutorial is available on YouTube by Quilt in a Day. 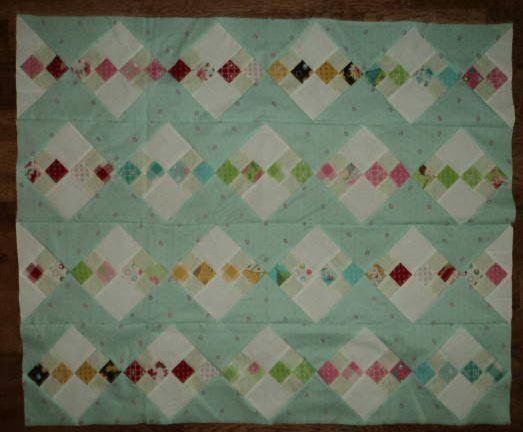 Sally also sent a picture of her “Double Four Patch” made with Quilter’s Candy (2 1/2″ squares). Inspired by Thomas Knauer’s book, The Quilt Design Coloring Workbook, Helga made a large table runner. She used a design roll from Free Spirit. Thanks, ladies for sharing photos of your wonderfully inspiring projects!